In nine or so months the world as we know it for accounting for fleet vehicle leases will change. A new international standard known as IFRS 16 will be mandatory in Australia from 1st January, 2019. The standard removes one reason why companies historically took out leases — that is that they could be removed from the balance sheet. Accounting standards boards around the world have struggled for years around the fact operating leases are not recorded on the company’s balance sheets even though they represent a future liability and asset. The new standard called IFRS 16 (the Australian accounting standards board calls it AASB 16) has been under discussion for 10 years and basically requires operating leases — from vehicles and equipment to property — to be recorded on the balance sheet. The benefit of keeping a lease off the balance sheet is the appearance of reduced liabilities. As companies depend on some type of banking facility, keeping leases off the balance sheet means they don’t affect the terms and convenants of any finance arrangement. IFRS 16, or AASB 16, by putting leases on the balance sheet will potentially affect finance and debt covenants. “In the world of accounting it’s a pretty big change because it does bring all those leases onto the balance sheet,” said Damien Berrell, Chief Financial Officer at fleet management group Custom Fleet. “My personal view, however, is that the off balance sheet treatment is low on the list of reasons why companies take out operating leases”. outsourcing non-core processes including supplier management and fleet logistics. Berrell lists these reasons in a presentation Custom Fleet is making to customers as they prepare for the introduction of the new standard. Some are adopting the standard earlier than the mandatory 1st January start date. Berrell said Fleet Managers and company financial officers of their customer companies are attending the roadshow currently running jointly with Ernst & Young in the accounting firm’s offices around the country. The big question people want to know is how they are going to get all the information required from their leases to comply with the new standard. “They need lease level information — when does the lease start? what payments? the term?,” said Berrell, adding, “The big one is this concept of being able to separate the portion of the lease that relates to the financing of the asset as compared with the portion that relates to the servicing of the asset — management fees, time, maintenance fees and that sort of thing”. 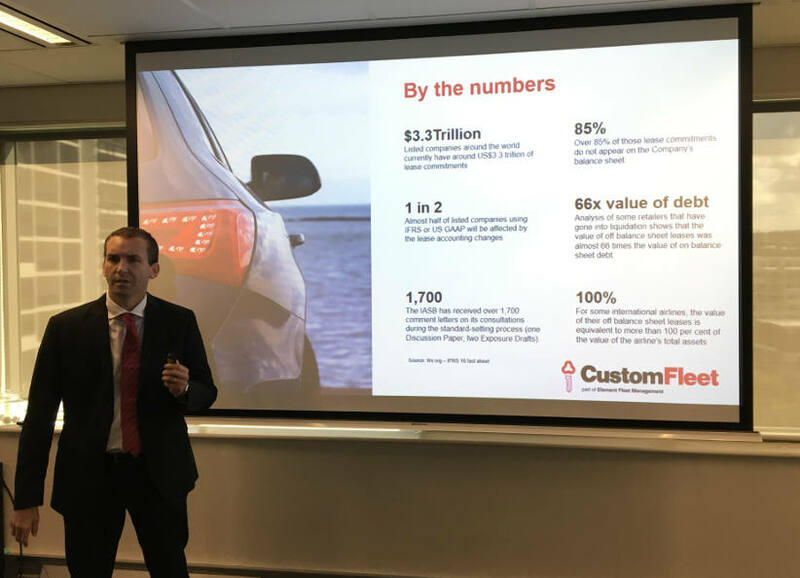 Custom Fleet has worked with the Australian Financial Industry Association to adopt a template it has developed for the treatment of vehicle leasing under the new standard. “This makes the motor vehicle leasing industry in Australia, the only industry of lessors to have adopted standardised reporting for its customers around IFRS 16 as far as I’m aware,” said Berrell. “I haven’t seen anything like that in any other industry I’ve worked in, so I was really impressed with that,” said John Askham, Director of Ernst & Young’s financial accounting advisory services, commenting on the template. “It’ a really good start. The fleet industry is probably more advanced than some of the other industries I’ve worked with in terms of the questions people are asking and the education that’s out there”.